It has been said time and time again that breakfast is an extremely important meal of the day. It is not only the fuel that your body needs to get up and get moving, but 95% of Americans now recognize how valuable it is to spend this time with their family. With that in mind, IHOP, the people who know breakfast, are helping us renew our commitment to the morning meal with a social media contest that just might get you re-energized! IHOP represents "everything you love about breakfast" and follows through with the welcoming, sit-down environment we all remember, expect and deserve. Now they are breaking new ground with an innovative advertising and marketing campaign that debuts nationwide and kicks off a summer-long schedule of promotions highlighting breakfast foods that can be enjoyed at any time of day: #BreakfastLove. The first phase of this fun campaign is all about Twitter. Simply tweet to @IHOP what you love about breakfast and include the hashtag #BreakfastLove and the link http://bit.ly/blrules. Doesn't get much easier than that, does it? 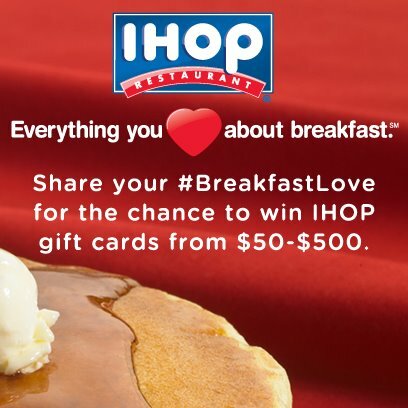 Tweet daily through July 8th to help IHOP reach 3,000 tweets, as the more tweets the closer we all are to unlocking a $500 IHOP gift card as the prize. Essentially, the more #BreakfastLove that is tweeted, the more breakfast you'll be able to get, so get your friends to join in as well! Ready to join in the tasty fun? You can find the official rules here (there is, of course, no purchase necessary to win) and then be sure to join IHOP on Twitter or Facebook to join in the tweeting for your chance to win. 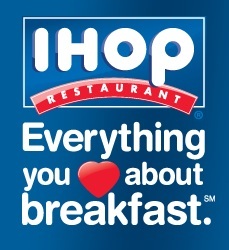 In the coming months, IHOP will introduce additional social media promotions on Twitter, Facebook and YouTube, as well as powerful new enhancements to IHOP.com... so be ready to show off your love of breakfast all summer long! Two lucky people will win a $25 gift card to IHOP! A big thank you to IHOP for providing a $25 gift card for two lucky giveaway winners. The opinions shared are my own and honest and if you really need to see more, click here to see how I roll. Breakfast is a meal that is good anytime of the day. It gets my day off to a good start! I love Breakfast food anytime of the day. i think it is fun to enjoy pancakes from time to time for dinner. Convincing my husband can sometimes be a little more difficult. I love that I get to start the day off right with my kids. I love the variety of foods available for breakfast. I also enjoy eating "breakfast" for dinner. French toast, pancakes, and orange juice! A happy way to start the day! I like breakfast to kick off a great day. I love to start my day with a good breakfast and one of my faovirtes is pancakes! Aside from the fact that it's the most important meal of the day, breakfast foods are by far so much yummier. Love that there are soo many different choices all the time ! Leave a comment on this post telling me what you love about breakfast! I love breakfast because there are so many delicious choices -- eggs, pancakes, oatmeal, and more! I love breakfast foods because they remind me of childhood. I entered on the rafflecopter with my Facebook username (Mary Happymommy). Thanks! I love that I can get away with eating something sweet. We love breakfast at our house because of the special feelings you have when you sit down to a big breakfast meal on a weekend or a holiday. I love syrup.... ANYTHING with syrup is good!! I love breakfast food. Breakfast is the fuel we need to start the day! I love visiting IHOP! It's the only chance I get to enjoy my eggs benedict! I love weekend breakfast especially because I get to hang out with the family and eat something yummy. I like to start our day off right with breakfast. breakfast is the best part of the day! Oh gosh all the yummy food that you can eat for breakfast and even dinner! I love that it gives me something to look forward to when I get up! I love that when I eat something healthy and yummy I'm happy and energized for the rest of the day. I love breakfast because it is often comfort foods! I love breakfast because it can be sweet or savory or a combination of both. Most of my favorite foods are breakfast foods. I love the options. Can be spicy, bland, sweet... whatever. Personally - Bacon, bacon, bacon! But seriously, we love all kinds of breakfast foods and my youngest would eat breakfast every meal of the day! I love breakfasts like waffles and warm maple syrup. We love breakfast for dinner once a week! I love it because I love french toast and oatmeal and eggs over easy. I love everything about breakfast! Such variety of easy to make choices! I love breakfast bec it was the one meal that my family sat together around the table growing up. I love eating certain breakfast foods like pancakes and sausage. I ♥ that I can eat waffles with strawberry topping, whipped cream AND syrup, without feeling ONE BIT of guilt over it!!! What DON'T I love about breakfast??! I love that it is good for any meal of the day & that it can be so filling without having to be fattening! I'm not really a breakfast person, but sometimes my coworkers and I hit IHOP at 2 or 3am after work! What's not to love?!?! Eggs, bacon and sour dough toast?! I'm IN!!! BACON!!! Need I say more? I like all breakfast foods. i love bacon thats what i love about breakfast. I love everything about breakfast, except that it's supposed to be eaten in the morning. We prefer breakfast for dinner. Thanks so much! 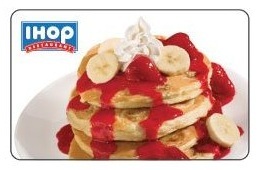 Eat Like a king at I-hop. May my day, please. I love my first cup of coffee of the day! I really like having a cup of coffee and a really good bagel. I love the smell of bacon or sausage frying, and the taste of crispy bacon by itself or combined in omelets. Pancakes, that says it all. I love everything about breakfast. When my boyfriend and I want to go out to eat, we nearly always wind up choosing a diner of some sort where we can get veggie and cheese omelettes with hashbrowns. You just can't beat that! I love breakfast because I enjoy traditional breakfast foods. I love waffles for breakfast. I love breakfast and my boyfriend doesn't. So we go to ihop to eat together! I love breakfast b/c it's the funnest meal of the day. I love breakfast food because it can be for any meal of the day. I love cooking breakfast for supper. I like breakfast because it gives you a good start for the day. I love breakfast because it starts the day off just right! And---I loveeeee me some french toast lol! I look forward to having breakfast every morning because it gives me a great start each day. i must admit i usually ski breakfast, but i love breakfast foods like pancakes, french toast and waffles. A good breakfast (with coffee) make any day better and ease any problems that you woke up with. I love having breakfast for dinner. I love most breakfast foods but don't have the time to make them in the morning! breakfast is when I have my one cup of coffee for the day, love that! Weekday breakfasts are usually rushed and crazy, but we enjoy our weekend family breakfasts as a great start to the day. Breakfast always means warm biscuits with lots of butter and jelly. French Toast gets me going!! I love having pancakes for breakfast! Puts a :) on my face! I love that breakfast is usually sweet foods since they are my favorite. Oh and my 1 cup of coffee! Corn Beef Hash! Best thing about breakfast! Love that breakfast tastes good anytime of the day. I love the smells of all the good breakfast foods! We have breakfast for dinner sometimes. I love the feeling of energy you get from a good breakfast. It's a great way to start off the day with family. I love breakfast foods! I don't often have time to eat a big breakfast, so the days when I am able to have all my favorites (pancakes, eggs, BACON!) are very special and fun. I love to eat breakfast anytime of day, love eggs,bacon and potatoes. Its the first meal of the day & I love when it's nutritious. Love that it's a tasty way to start the day! Breakfast keeps me going and I have a sweet tooth so that keeps me alert. I love that breakfast is a time to get together with the family before the day starts. I love breakfast food! I can eat it all day. I love the smell of coffee and bacon! I love that breakfast jump starts my day !! I enjoy all the foods of breakfast. Hard to beat coffee - Couldn't start my day without it. I love breakfast foods. I could eat breakfast at any time of the day or night. French Toast and family time! Bacon is the number one reason why I like breakfast. It's my favorite food. I love that you can have it anytime & there are soooo many choices. Breakfast has a lot of my favorite foods. Biscuits and gravy, eggs and bacon, french toast, etc. I love how the smell of bacon cooking, coffee brewing and plates clattering arose even the deepest of sleepers. Reminds me of cozy mornings at home with my baby boy and my hubby, and family! It gives me energy to start the day! I love everything about it...the juice, the coffee, the pancakes, the bacon...the smells and the taste...ciao4now64 at yahoo dot com. my favorite quote upon seeing her eat a chocolate cookie at breakfast replied, It's dessert cleverly disguised as breakfast! I also just love that it is the start to each day for me and sometimes gotta have me some oatmeal cookie pancakes. I love that breakfast is delicious! I enjoy breakfast after being asleep all night! I love breakfast because there are so many choices, pancakes, eggs, waffles, so much more. We love breakfast anytime. i love anything with syrup! I love the variety of foods you can eat! The crepes are wonderful. I plan to order something different when we look at the menu, but day or night, I'll end up ordering those Loganberry crepes. I love all the sweet breakfast treats, like pancakes, waffles and muffins. Thanks for the chance to win! I love the variety of food for breakfast. Waffles, pancakes, muffins, biscuits, eggs, etc. Really gets your morning off right. We also sometimes have breakfast food for dinner which is a delight. I like breakfast because it starts your out fresh. Breakfast foods are so good. Who doesn't love eggs, hashbrowns, toast pancakes. Yum! We love to eat breakfast morning and night, it's a great way to not only enjoy comfort food but to get the opportunity to chat and enjoy each others company! Oh, everything! I love the quiet and the ability to get a gradual start to the day. Also, I adore breakfast foods--to the point where I often have "breakfast" for dinner. I love it that it is a start to a new day. I love breakfast and it's a great way to start the day with my son... bacon, bacon and more bacon ! I like the choice of breakfast foods. My wife makes me a cream cheese and pepperoni sandwich for breakfast. I love everything about breakfast, but especially the Bacon! I love the energy I have after I eat breakfast. Pancakes! I never make them so it's special to have them when we go out. I like breakfast because it's delicious anytime of the day. I love it because of family time and pancakes! I like a big breakfast with the family on the weekends! I love the everyone actually talks to each other in the morning before a busy day. I'm always hungry in the morning- I have to love breakfast!